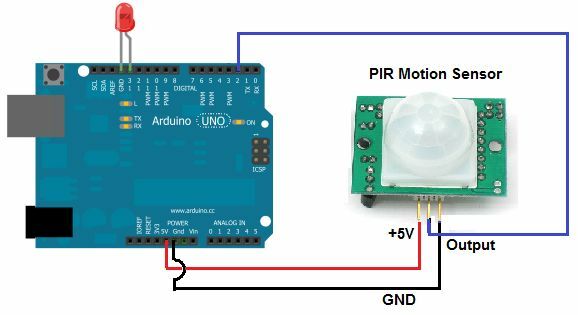 The PIR (Passive Infra-Red) Sensor is a pyro electric device that detects motion by measuring changes in the infrared levels emitted by surrounding objects. This motion can be detected by checking for a high signal on a single I/O pin. It operates on 5v DC Supply. 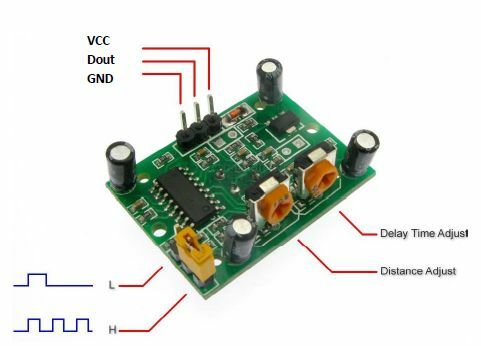 It gives Logic high output (5V) whenever any motion is detected. This can vary with environmental conditions. The sensor is designed to adjust to slowly changing conditions that would happen normally as the day progresses and the environmental conditions change, but respond by toggling its output when sudden changes occur, such as when there is motion. The PIR Sensor has a range of approximately 20 feet. Pyro-electric devices, such as the PIR sensor, have elements made of a crystalline material that generates an electric charge when exposed to infrared radiation. The changes in the amount of infrared striking the element change the voltages generated, which are measured by an on-board amplifier. The device contains a special filter called a Fresnel lens, which focuses the infrared signals onto the element. As the ambient infrared signals change rapidly, the on-board amplifier trips the output to indicate motion.